This is an exquisitely crafted “one-of-a-kind” world class estate ring. It offers a gorgeous design with detailed craftsmanship adding to the amazing style. The unique “FINE GRADE” ring was made at the hands of a true jewelry master craftsman. 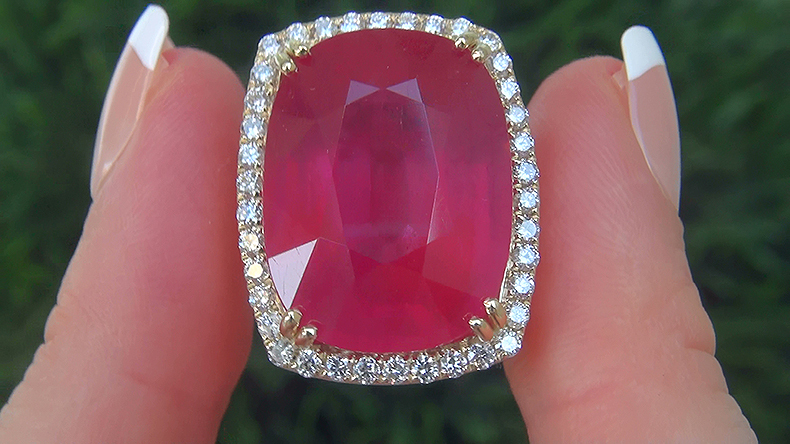 Spectacular Vivid Red Color & Colossal Size” 25.44 Carat Certified Natural Ruby & Diamond Cocktail Ring. This gorgeous ring boasts a COLOSSAL 24.71 carat (exact carat weight) genuine heat treated and glass filled ruby with an intense “VIVID Red Color”. The world class dynamic solid 14k yellow gold ring is set with a generous 0.73 carats of VS2-SI1 clarity near colorless G-H-I round brilliant diamonds all set in a gorgeous master crafted custom made setting that will dazzle even the most discriminating connoisseur. 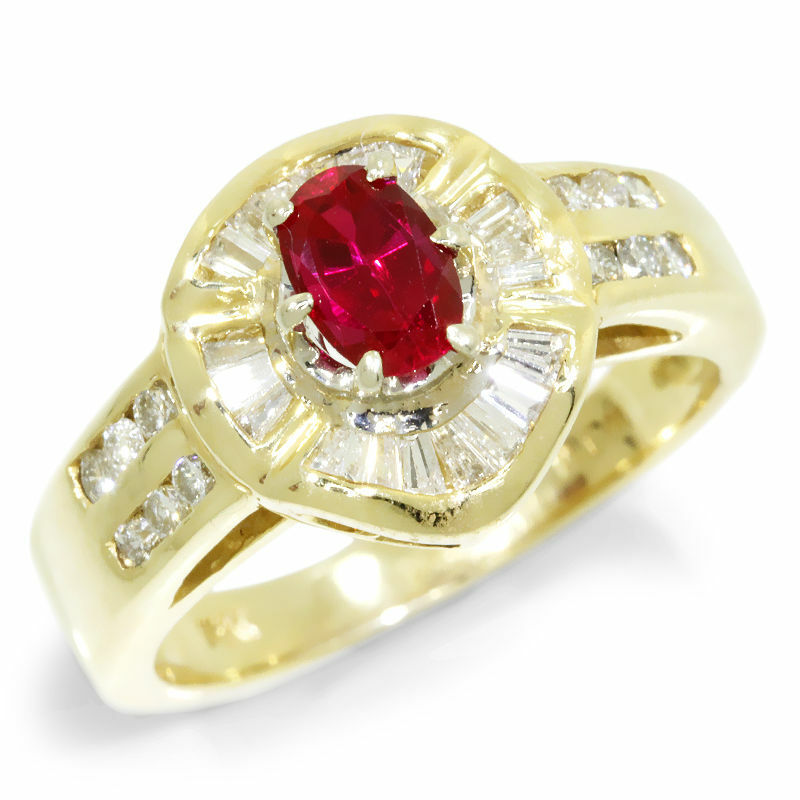 Superb quality and Sublime elegance in this beautifully designed Certified ruby ring. CERTIFIED 25.44 carat estate engagement – anniversary – cocktail ring featuring a SI Clarity Natural Heat Treated and Glass Filled Ruby set into SOLID 14k Yellow Gold and accented with sparkling diamonds. The “Jaw Dropping” Ruby measures 19.80 mm x 15.00 mm x 19.20 mm with the highly sought after Rich VIVID Intense Pigeon’s Blood Red Color and a Cushion Brilliant Cut weighing a WHOPPING 24.71 carats (exact carat weight). There are also 38 round brilliant natural untreated accent diamonds totaling an additional 0.73 carats set with the Ruby in a classic style. These “Perfectly Clear” diamonds are graded at Near Flawless to Eye Clean “VS2-SI1” Clarity with NEAR COLORLESS “G-H-I” Color so you can be assured of the OUTSTANDING quality, excellent brilliance, flash, sparkle & fire. The ring measures 23.20 mm x 18.45 mm at the head and sits up 11.80 mm off the finger. The total ring weighs a HEAVY strong & sturdy 13.04 grams and is constructed of solid 14k Yellow Gold with exceptional QUALITY natural gems. Captured in this stunning ballerina ring is a approx. 0.55 carat oval cut purplish red ruby surrounded by a halo of channel set tapered baguette cut diamond’s. Round brilliant diamond’s are encrusted in two rows on each side of the shank, which are also channel set. The estate ring has an overall smooth and flowing quality which resonates superior craftsmanship and exemplary quality. The combination of 14kt yellow gold, white diamond’s and a vibrant red ruby form an elegant and fun accompaniment to any wardrobe. An important collar necklace by Jahan. 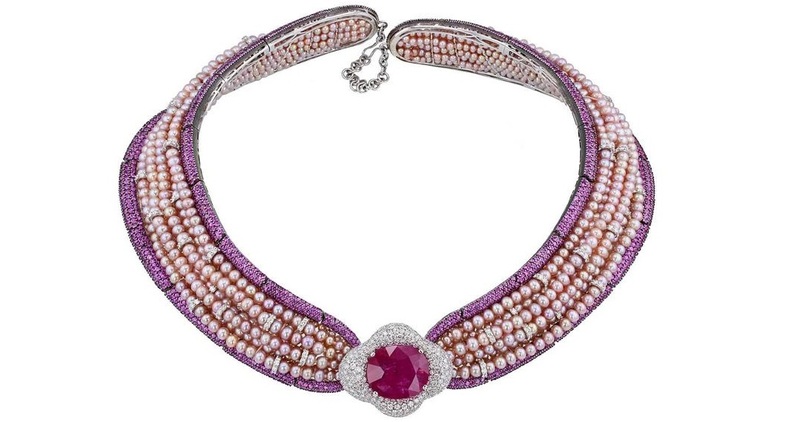 Strands of pearls are strung to form a collar, bordered by pavé-set, brilliant-cut pink sapphires in 18-carat white gold. The large 30 carat central oval-cut ruby mounted in a scalloped 18-carat white gold setting, pavé-set with brilliant-cut diamonds. 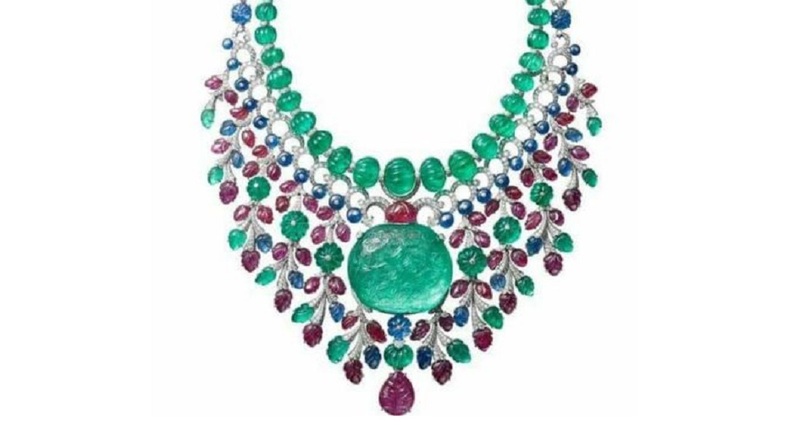 A bold, impressive and stylish piece of jewelry by one of Switzerland’s famed jewelers. Accompanied by a certificate from GCS London stating that the ruby is of Burma origin. 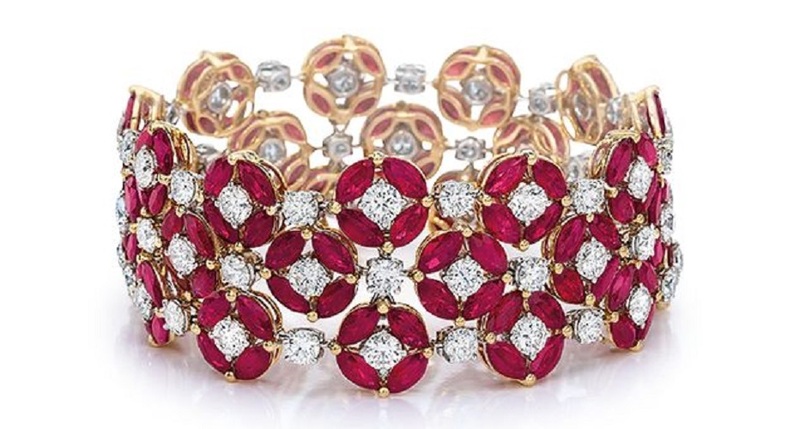 Ruby and Diamond Bracelet – 3-row bracelet of marquise-shape rubies, in clusters of 4, forming circles with a round brilliant-cut diamond at each center, in a pattern with diamonds as connectors; in 18-karat rose gold. Dimensions: approx. 1″ wide x 6 5/8″ long. This gorgeous bracelet is available at Cellini Jewelers. This is such a bold ruby and diamond vintage reproduction ring as it could be worn as a right hand ring or as engagement ring. The setting is made of solid 18kt white gold and every surface has been intricately engraved and carved into a beautiful homage to early Art Deco and Art Nouveau designs. There is a beautiful open filigree detail along the sides of the setting as well as milgrain beaded edges and floral motifs. There are 50 round full cut natural diamonds encrusted into the design around the centerpiece and along the shank. Four polygonal cut natural rubies in bezel settings accent the centerpiece to its North, South, East and West. 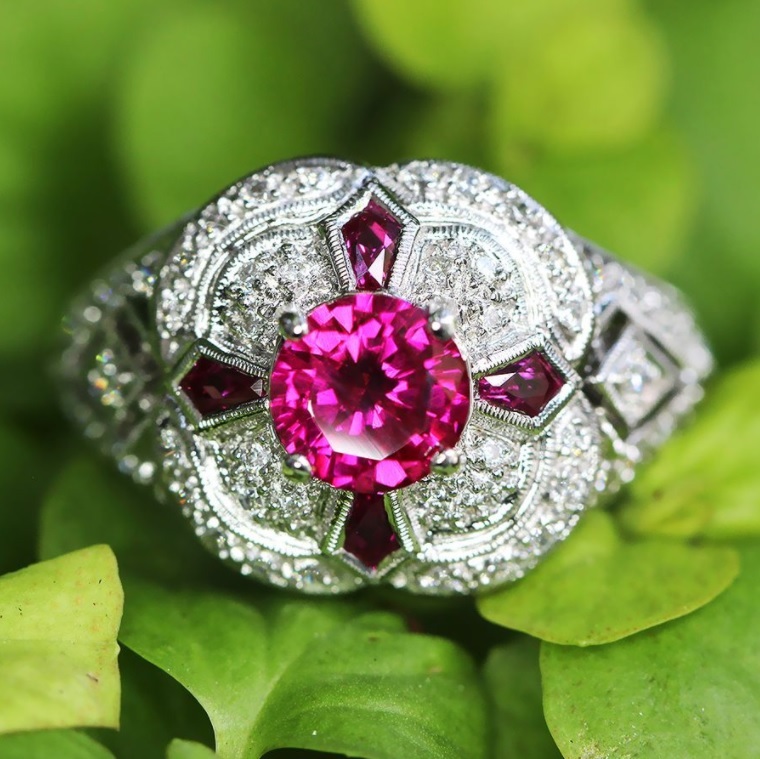 The center July Birthstone precious ruby is a round cut gem in a 4-prong setting weighing 1.09 carats and displays an intense pinkish purple hue which is a different hue than its accents as they exhibit a more purplish red hue. The gem is a VS quality gem and is absolutely brilliant. The ring weighs 5.8 grams and is currently a size 7.25 and can be resized. It rises 9.40mm above your finger and its ring face measures 13.65mm from North to South and 13.95mm from East to West. This ruby and diamond ring is Brand New. 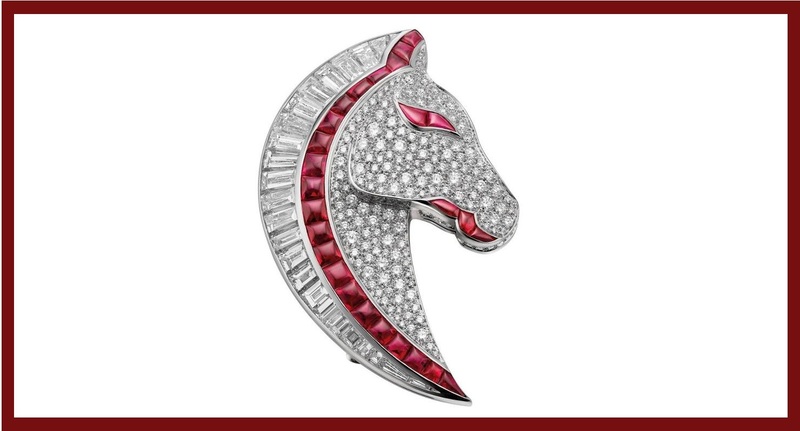 This horse head brooch is made with 18k white gold with 26 rubies, 24 trapezoidal step diamonds and diamond pavé by Bulgari. 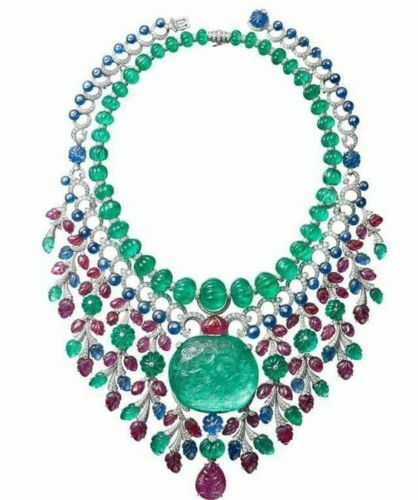 A Gorgeous Cartier Platinum Necklace consisting of one 136.97-carat carved antique cushion-shaped emerald from Colombia, forty-six melon-cut emerald beads from Afghanistan totaling 343.68 carats, one 22.61-carat carved pear-shaped ruby, one 16.40-carat carved sapphire from Burma, carved rubies, sapphires and emeralds, sapphire beads, melon-cut sapphire beads, kite-shaped diamonds, brilliant-cut diamonds. The necklace can be worn in three different ways and as a brooch. 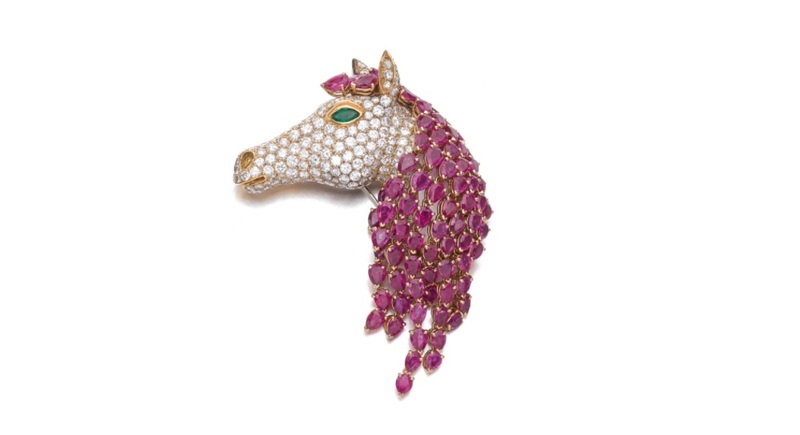 Designed as a horse’s head, pavé-set with brilliant-cut diamonds and marquise-shaped emerald eye, the mane set with pear-shaped rubies. 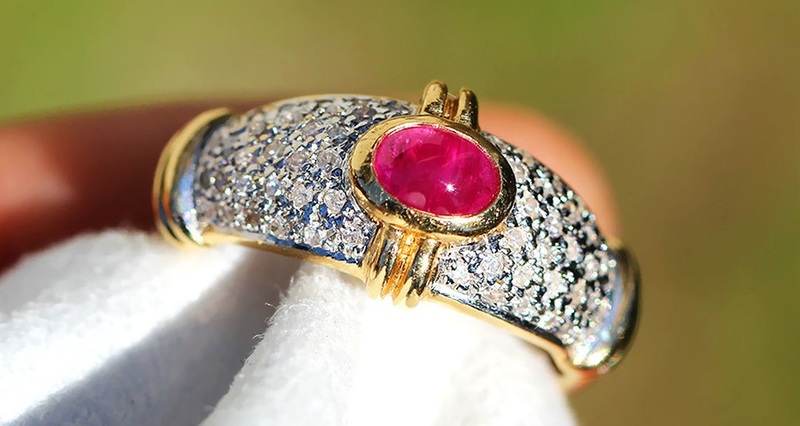 This is a very unique and beautifully design ruby and diamond ring made out of solid 14kt two tone gold. The ring showcases a vivid purplish red oval cabochon cut natural ruby in a bezel setting at its center in yellow gold. Flanked on its East and West sides are pave set natural diamonds in white gold. 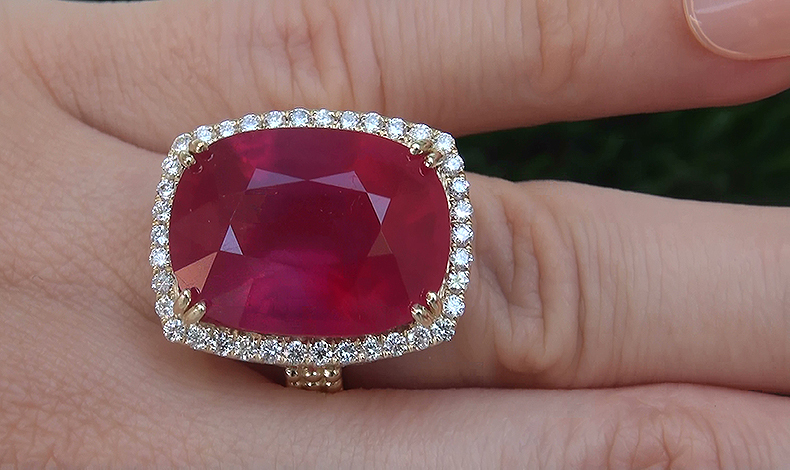 The ruby weighs about .50 carats and seems as if the ring was made just for it. There are 60 single cut natural diamonds graded H-I in color and SI2-I1 in clarity and they together weigh about .25 carats. The ring weighs 3.7 grams and is currently a size 7.5 and can be resized. It rises 5.65mm above your finger and its ring face measures 10.25mm from North to South and 21.65mm from East to West. The bands width measures 6.70mm and tapers down to 2.30mm This vintage estate ring from the 1960s is in spectacular condition. 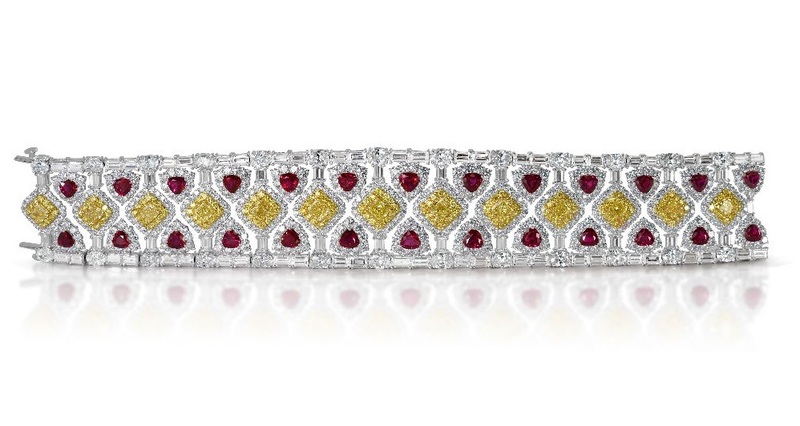 Setare Jewelry wanted this spectacular statement piece to dazzle, so they paired 12 intense yellow diamonds totaling 7.2 carats, with 26 genuine Burmese rubies totaling 16.37 carats. They then added 4 carats of fancy yellow diamonds, and surrounded the piece with 45 carats of flawless mixed diamonds. This stunningly designed bracelet will sparkle, dazzle and impress.